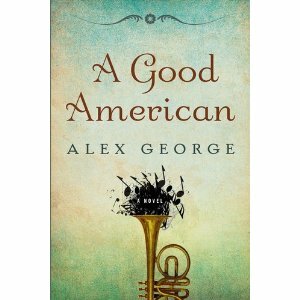 I am very proud finally to be able to show you the US cover for A GOOD AMERICAN. I had discussed various possible themes with Amy soon after the text was finished, but really had no idea what to expect when this little electronic file plopped into my inbox. I was, I can admit now, a little apprehensive. But I absolutely adore this. I think it’s elegant and classy and I am very proud of it. Not much more to say, really, other than I hope you like it, too. Do let me know what you think. Love it! If I were judging a book by its cover, I would totally check this out from the library! But since you’re my friend I think I’d even buy it! It’s gorgeous, Alex. Atmospheric and tastefully done. The whole process is such a grand one, really. I can’t tell you how many people assumed I would have (or would want!) huge say in the final cover, but frankly I was so excited to see someone ELSE’S interpretation of my story. Hope you’re pleased–it will be quite eye-catching on the shelves too, which never hurts. Seeing as this was about to be unveiled, I made a proper cup of perfect coffee and prepared to be blown away. I was not disappointed! It draws me in and makes me want to know more….there is a definite “why” factor, and I can’t wait to turn the cover over and see what’s inside. I’ve often bought wine just for the label–and many times been very happy with the wine! Could be the same thing will happen with your book; best of luck! Thanks, Erika – yes, I love it, and you’re right: I was excited to see what someone else would make of it (especially since I am a very non-viusal person.) I really had no idea what they would come up with. I do rather feel as if I have hit the jackpot! Ah, interesting book/wine analogy, Mary! Will think on that some more. Glad you approve, though! It is beautiful and classy! How interesting to see the visual representation someone else creates from your words. Very cool! Looking forward to reading it! Thanks, Julia! Yes, watching someone else’s interpretation of the book was one of the most interesting (and nerve-wracking!) bits of the process. I was consulted about what I thought should be on the cover but my thoughts were mainly proscriptions (e.g. no flags, etc.) I really had no idea what they would come up with. But I really couldn’t be happier.